Experience Downtown Blue Ridge in your back yard! Walk to Shops, Restaurants and Scenic Rail Road. Put everything in Downtown Blue Ridge at your fingertips! This charming and well appointed Vacation Rental is centrally located in the heart of Downtown. Walk to all the Blue Ridge shops, scenic rail road and nightlife right from your back door. At Blue Ridge Cottage, you'll realize just how simple your vacation can be. With such a nice location in Downtown Blue Ridge, planning for dining, shopping, and other activities are easier than ever.This tastefully decorated home is roomy and comfortable enough for up to 6 guests. 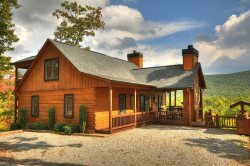 Blue Ridge Cottage offers a cozy bedroom on each level creating a haven of privacy and modern luxury. The Master Bedroom upstairs invites you to come relax and slumber in its King Bed and spacious private bathroom. Don't forget to light the fireplace and snuggle up for a movie in bed! The private balcony gifts you with a lovely view of the quaint downtown area. Come back down to the entry level to find another fresh and cozy bedroom. With a fully equipped kitchen, you can cook any mealtime favorites...But we won't blame you if you would rather take advantage of the fantastic dining options Downtown Blue Ridge has to offer. You're on vacation right? The dining and kitchen area offer plenty of seating for your and your guests for any meal of the day. Afterward, invite them to the living room where you can sit in front of the fire and make vacation memories with your loved ones. Regardless of how you spend your day, you can always find some extra fun in the downstairs game room. The lower level also offers another bedroom for you or another guest to rest your tired bones at the end of an adventurous day. It's safe to say that Blue Ridge Cottage is a top-notch place to spend your next vacation! Fenced in yard with gate to city stairs to mountain Street. Very nice, helped me change reservation from 2 nights to 3 nights. I highly recommend this home if you are interested in a property that is walkable to downtown Blue Ridge! This is just a few minutes! Lots of steps from parking pad to front door, and challenging steps from door to the street, not good for folks who have trouble with stairs. But if stairs not a problem, this house is great. We loved that the bedrooms were split on 3 levels, everyone had privacy. TV's and WIFI good! Pool table nice. Two teens loved the lower level and adults upstairs. Great home! Everyone on the team was a joy to talk to. Very easy process to check in and out. The call the next day to assure we found the house to our standards was an excellent customer service move. The attention to detail throughout the reservation and during the stay was outstanding. I can't rate this house high enough. It is gorgeous! The owner has certainly thought of everything! We didn't want to leave. I can't say there was a favorite. The whole house and accommodations were fantastic! Everyone had their own space. Truly a beautiful home. Third year for us, nice convent place to stay. We enjoyed it thoroughly and were in constant awe at the beauty of the furnishings and overall space. I've stayed before and brought of my friends this time. We are planning to come back as a group yearly. Everyone was extremely friendly and helpful! I appreciated a call from ray asking us if everything was okay and if the property was to are liking. We had a wonderful time! This property will be rented again by our family. This trip was girls Weekend and the shopping was close by, within walking distance. We. Had. A. Fabulous. Time! Clean and homey. Perfect location, perfect amenities, perfect home! We will be back! Friendly staff - thorough and informative with specific suggestions for our stay. I was pleased with our accommodations- very clean and comfortable. The cleaning staff deserves a lot of credit; this is one of the cleanest rentals I have experienced in my many travels. I appreciated the follow-up call from Ray the day after we checked in to the rental. Everyone was most helpful and friendly. The property was just right for our needs. We had plenty of room and convenience for shopping and dining. This property is available for purchase. Guest may be asked by management to allow a Licensed Real Estate Agent to show the property by appointment only during occupancy.This request is at Guest discretion. Contact management office for sales information.